This white bus box will provide quality service under normal use and wear. This tub features a pebbled exterior finish and sturdy reinforced handles. Its polypropylene material delivers quality durability, while its classic design is stackable and great for storage. Great for use with food, this bus box is freezer safe to -22 degrees. This is a very nice clean looking bus tub. I use these as storage for my storage room. the 7" height is perfect for storing larger items. These are great for quickly clearing dirty dishes and utensils from the front of the house. They are also nice for dry-ingredient organization. We place our bags of granola in them and they place on the shelf. I have these bins in several colors and several sizes, and all of them have been great. These 7" high ones are really nice for the bigger jobs. It's a bus tub. I ordered the white ones to use exclusively for chicken and these things a quality pieces of equipment. I've never had a complaint about them and they are very tough. Great for storing food especially vegetables as it gives ample space. The handles are great and can handle a heavy load. Its the perfect size as it fits in most commercial dish machines and also easy to clean in regular sink. I bought these to carry frozen meats and they work great. Even though they're a bright white, they haven't stained on me and stay looking fresh. same as our black tub.We use the white ones for our vegetables,onions and green peppers.doesn't hold the smell.washes very easily.Would purchase again because they don't stain either like the cheaper ones. These bus tubs are great! The other ones I had before cracked at the handles, but these are nice and sturdy. They can even stand up to boiling water without melting. I can use them to wash and store things in. These are exactly what I needed. These are excellent commercial quality tubs, they work very well and are going strong for the two years I've had them. They make my job a lot easier. I use these bus tubs for storage. There is a lid for them as well that is sold separately and they are very sturdy and durable. This white polypropylene bus tub and bus box is exactly as advertised. I bought the corresponding lid and together they form a very solid and affordable food container. i like the color white on this storage polypropylene bus tub , it looks elegant and great , build well build , nice price , what more ! I love the white bus tubs in my baking and pastry laboratory. It allows me to color code which classroom the bus tubs belong to-gray tubs in my second commercial kitchen. These buckets are great! I bought them for dish washing and autoclave use. They are perfect and are holding up well with frequent use! They are rather large, so these are not your average at home use dish pails. Standard bus tub and it comes in a number of different colors. They are really durable, made from a good material, so you won't have to worry about them breaking with usual use. We use them for some of our prep items and they are able to stack with the lid. Surely a good purchase for the price. 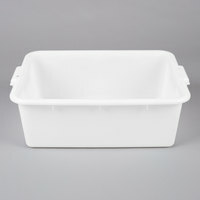 The depth of this bus tub has come in handy for storing and delivering items to events. Multiple boxes stack and do not slide around during transport. These tubs are handy in the summer months for transporting vegetables from the garden to the canning plant, washing vegetables, transporting the finished product canned goods back home. sturdy bus tubs used for clearing caterings from our meeting rooms. Fit like a glove on our cart and hold liquids from left over glasses great. No leaks from left over drinks. I use these as light duty meat lugs, for making sausage. The clean white plastic is easy to clean, and these are built heavy enough to handle 30 lbs of meat with no issues. Used with the matching lids, these are a great, low cost solution to my needs. More kitchen utensils, cloths, spatulas, etc. basically whatever objects used in a kitchen that's not stored in the kitchen. Again this will help the clutter by placing in a bin instead of over stuffing a drawer. This is a good sized bus tub and can take quite a beating. They even work well for food prep because the sides are low, so it's easy to get your hands in something if you're short. These bus tubs are such a low price. They are durable but strong for the price and the handles are sturdy when moving it full. They stack neatly when not in use. Fast delivery. Very happy with these Bus Tub. They are strong and huge but stay light. Perfect to store dough, flours... Not a big deal at all to clean. Love these bus tubs. We have a lot of tables become empty at once, so we have several of these that we use to clean them off fast. Great quality bus tub at a good price. I would also recommend getting a darker color that doesn't show wear and stain so easily though. Since the bus tub is white, it is easy to see any dirt of food that is accumulating. I use it at home to keep the sink clear and place dirty dishes into the tub off to the side. Can also work well for mixing ingredients, brining food, or any other food prep. Bought 60 of these with the accompanying lids. Were put under heavy use during a recent large event and held up well. Prefer the black though which i also purchased but that's a matter of personal preference - plus these are semi translucent which has its own benefits. This is a very nice quality bus box. Very durable and can withstand tons of abuse in the kitchen. I would buy this product again. I use these for bulk pizza dough fermentation. They fit perfectly in my make line fridge and can hold about 25 lbs of 63% hydration dough (about 38 pizzas) leaving enough room for expansion. I'm a food truck operator and these have really saved me some space vs the tall round food containers. Great bins, they are great to keep inside walkin to store produce or to keep on the dry storage racks, very multipurpose. They are also sold a great price. These are amazing. we used to purchase the name brand ones and it turns out that these are actually better made! more supports under the lip of the container. Awesome. I use this bus box in my soap kitchen. While working with bowls, spatulas, spoons, etc. that come in contact with lye, I just toss them in the bus box and transport them all to my utility sink for washing when I'm finished. I love the super large size and have recommended it to fellow soap-makers.